Our host sponsors for TBEX 13, Tourism Toronto, tell me that there’s plenty of reasons TBEX attendees will want to stay in Toronto for awhile. 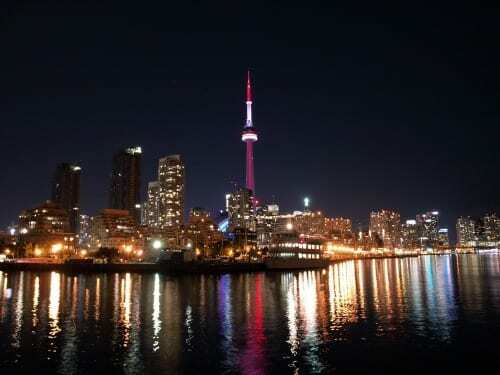 Take a look at these major events and top performances taking place in the greater Toronto area during May and June, 2012. Whether you’re looking for cultural performance, family friendly exhibitions, neighborhood festivals, or a little of it all, I think you’ll want to stay in Toronto for awhile, too. 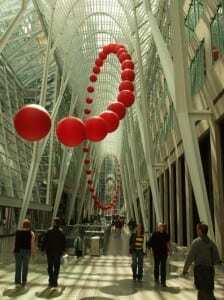 Big at the Royal Ontario Museum – Until September 21, 2013. On Saturday, November 3, 2012, the Royal Ontario Museum (ROM) unveils BIG, the newest installation in the Patricia Harris Gallery of Textiles & Costume on Level 4 in the Museum’s Michael Lee-Chin Crystal. A stunning display, BIG is exclusively drawn from the ROM’s collection of nearly 50,000 textiles and costumes. Showcasing 40 artifacts from around the world, this unique exhibition includes objects assuming their BIG status in a myriad of ways. With some objects publicly displayed for the first time, the installation offers a fresh, new way of exploring the ROM’s renowned collections. Giant Pandas at the Toronto Zoo – Spring 2013. It’s true – two lovable black and white giant pandas are coming to the Zoo in 2013 and already the excitement is building. As part of a long-term conservation partnership agreement between China and Canada, signed by Hu Jintao, President of China and Mr. Stephen Harper, Prime Minister of Canada, China will loan two giant pandas to zoos in Canada. The good news is that Toronto Zoo will be home to the breeding pair for a minimum of five years, beginning in the spring of 2013. The pandas will then relocate to the Calgary Zoo sometime in 2018. However, in the event that breeding is successful while the pair are at the Toronto Zoo, the pandas and offspring would remain in Toronto until such time it is approved to move them. Game On 2.0: An Exhibition at the Ontario Science Centre – March 9 – September 2, 2013. Play your way through the history and evolution of video games with over 150 influential games. Game On 2.0 focuses on key game developments between 1962 and today, and takes a global perspective at gaming’s fascinating past and limitless future. From Pong to Gran Turismo, explore over 50 years of electronic gaming. Play through the past, present and future of global gaming, from the very first commercial coin-op game to the latest in virtual reality and 3D technology. Hot Docs – April 25-May 5, 2013. North America’s largest documentary festival, conference and market, will present its 20th annual edition. An outstanding selection of 180+ documentaries from Canada and around the world will be presented to Toronto audiences and international delegates. Hot Docs will also mount a full roster of conference sessions and market events and services for documentary practitioners, including the renowned Hot Docs Forum and The Doc Shop. In partnership with Blue Ice Group, Hot Docs operates the Bloor Hot Docs Cinema, a century-old landmark located in Toronto’s Annex neighborhood. The Book of Mormon, Mirvish productions – May/June 2013. Nine 2011 Tony Awards® say it’s the Best Musical of the Year. Vogue says “It’s the best musical of the last 25 years.” And The New York Times says, “It’s the best musical of this century.” It’s THE BOOK OF MORMON, the Broadway phenomenon from South Park creators Trey Parker and Matt Stone and Avenue Q co-creator Robert Lopez. Carassauga: Mississauga’s Festival of Cultures – May 24-26, 2013. Experience the tastes and sounds of more than 64 countries at the largest multicultural Festival in Ontario. 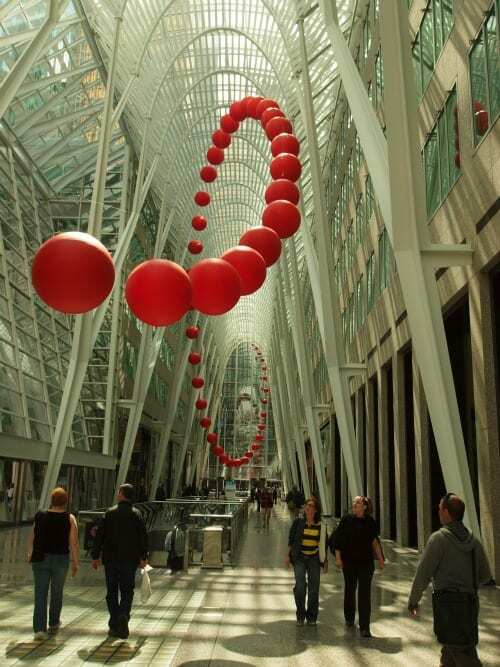 Scotiabank Contact Photography Festival – May 1-31, 2013. CONTACT, the world’s largest annual photography event, is a month-long festival of photography with over 1000 local, national and international artists at more than 200 venues across the Greater Toronto Area. Canadian Opera Company’s Dialogues des Carmélites – May 8, 11, 14, 17, 19, 21, 23 and 25, 2013. Bringing the season to a close is Francis Poulenc’s operatic masterpiece, Dialogues des Carmélites. This performance has been described as “subtle, yet gut-wrenching.” Dialogues des Carmélites’ beautiful music sets the tone for the story of an order of Carmelite nuns caught up in the terror of the French Revolution. Dialogues des Carmélites runs for eight performances at the Four Seasons Centre for the Performing Arts and is sung in French with English SURTITLES™. Patti Smith: Camera Solo at the Art Gallery of Ontario – Until May 19, 2012. A glimpse into the world of legendary musician and artist Patti Smith through an intimate exhibition featuring photographs, personal objects, and a short film. This is a rare opportunity to experience a different side of this rock icon – best known for her profound influence on the nascent punk rock scene in the late 1970s and 80s – through her poetic expression in the visual arts. This exhibition highlights the continual connections between Smith’s photography and her interest in poetry and literature. For more than four decades, she has documented sights and spaces infused with personal significance. Her visual work possesses the same unfiltered, emotional quality prevalent in her poetry and music lyrics: their allure lies in their often dreamlike imagery; their modest scale belies their depth and power. The exhibition features approximately 70 black and white photographs taken with Smith’s vintage Polaroid camera, presented here as gelatin silver prints, alongside personal objects. The exhibition also features Equation Daumal, a film directed by Patti Smith and shot by Jem Cohen on 16mm and super 8 film. Musicfest Canada – May 13-18, 2013. MusicFest Canada is celebrating its 41st annual festival at the University of Toronto in downtown Toronto. During the week-long event MusicFest “The Nationals” will bring together more than 10,000 of Canada’s finest young musicians in 300 ensembles. They will represent their schools and communities and will perform for national recognition. During the Festival, MusicFest will present concerts and mini-concerts featuring guest artists from all over the world. Doors Open Toronto – May 25 and 26, 2013. Toronto was the very first city to host Doors Open in North America! Over 130 architecturally, historically, culturally and socially significant buildings open their doors for the weekend and highlight the people who built the city. All for free! Waterfront Blues Festival– May 31-June 2, 2013. The Waterfront Blues – Metro Toronto’s only genuine Blues festival – will once again be presenting top flight talent! And this year they continue to uncover some gems of the Blues. Many performers, vendors, food (BBQ, etc.) and more. The Streetsville Bread and Honey Festival – Dates not confirmed at this time. Where’s the best place to go for sweet goodies, excitement and a whole lot of fun for the whole family? The annual Streetsville Founders’ Bread & Honey Festival. This year the celebration will feature bigger and better live entertainment and a wide selection of rides and games for the whole family, including a massively popular village-wide parade, three stages filled with activities for everyone, a Rotary Pancake Breakfast, hands-on educational demonstrations, free Bread & Honey and much, much more. Carmen, National Ballet of Canada – June 5-16, 2013. The very title conjures up images of sultry, physical passion, unleashed emotions and anguished eroticism. Davide Bombana’s 2006 one-act interpretation of the Carmen story, so familiar to audiences through Bizet’s opera, brought all of these qualities to the stage in an unforgettable flourish of dazzling balletic intensity. Woofstock – June 8 and 9, 2013. When Woofstock launched in 2003, the Toronto Star called it “the summer of canine love”. What else can you call 300,000 dog lovers and their four-footed friends coming together each year for this wildly popular doggie love-in. Woofstock is the largest outdoor festival for dogs in all of North America. One year it was beamed around the world on CNN for the entire weekend. North By Northeast – June 10-16, 2013. North by Northeast (NXNE) has become the Canadian festival destination for emerging artists and major-label headliners, for music filmmakers, and for digital interactive innovators bridging the gap between technology and the arts. Seen as the most anticipated summer music event in Canada, NXNE Music, NXNE Film, NXNE Interactive, and NXNE Comedy are an essential gathering for artists, industry, and fans. For five days and nights, NXNE Music offers the hottest music and the freshest music-related ideas—all within a few km of each other. NXNE 2012 presented over 650 international, national and local acts at 50 official festival stages in downtown Toronto’s famous club district. NXNE Film screens 40+ of the year’s best music-themed features, documentaries, shorts, and experimental films from around the world. NXNE Interactive (NXNEi) is a digital interactive media conference like no other. It brings together content-creating artists, tech entrepreneurs, digital marketing gurus, web business experts, and social media aficionados for four days of workshops, presentations, and panels that explore the newest ideas in bridging the gap between creativity and the interactive world. Mississauga Waterfront Festival – Dates not confirmed at this time. Voted one of Ontario’s Top 100 Festivals nine years in a row, MWF has set new standards for excellence, earning accolades from industry peers, business partners, media and attendees, and is known for presenting the best in Canadian and International talent. The children’s stage is home to popular TV stars like The Backyardigans, Max & Ruby and Dora the Explorer while the Family Fun Village offers everything from stilt walkers and fire-eaters to exciting water shows, family carnival, interactive sports activities, delicious food and unique crafters and vendors. TD Toronto Jazz Festival – June 20-29, 2013. 1,500 musicians at 40 locations. The TD Toronto Jazz Festival has become known as one of North America’s premier jazz festivals produced annually by Toronto Downtown Jazz. What began in 1987 as an eight day showcase of jazz now attracts in excess of 500,000 loyal patrons annually over 10 days. Attractions include more than 350 performances with over 1,500 musicians performing at approximately 40 locations around Toronto. Dragon Boat Race Festival – June 22 and 23, 2013. This festival combines a sporting event with loads of entertainment and events that have a multi-cultural flare. It’s held on Toronto Centre Island and approx. 200 teams with over 6,000 paddlers compete in over 100 races over the 2 days. 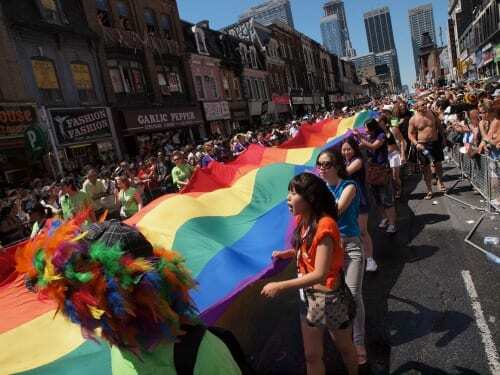 Toronto Pride – Dates not confirmed at this time. As one of the largest Pride celebrations in the world, with an estimated attendance of over 1 million people, Pride Week celebrates our queer community’s diverse sexual and gender identities, history, culture, creativity, friends and lives. Pride Week features 10 days of world-class arts and cultural programming, community activities, one of the world’s largest street festivals, Pride Parade, Dyke March, Family programming, Blackness Yes and Youth and much more. Digital Dreams at Ontario Place – June 29 and 30, 2013. A Canada Day weekend celebration. Great listing! Even if I wasn’t coming to TBEX – so much to do! Thanks.